Suggestion came after more than an hour of public condemnation of Prasad and criticism of the Township Council. Added by Bill Bowman on September 14, 2018. 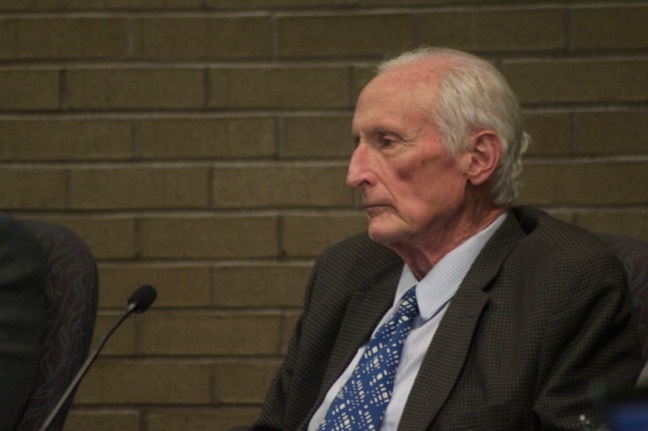 Township Councilman Ted Chase said his fellow council member, Rajiv Prasad, should “consider resigning” over the “Peace and Non-Violence” monument park issue. A Township Councilman on Sept. 13 called on an embattled colleague to “consider resigning” over his actions in furtherance of the proposed “Peace and Non-Violence” monument park. The comment came from Councilman Ted Chase (D-Ward 1) after members of the public had eviscerated the council in general, and Councilman Rajiv Prasad (D-At Large) in particular, for more than an hour over Prasad’s handling of getting approvals for the monument park, targeted for a quarter-acre on township open space. Several of the residents who spoke during the meeting’s public portion also called on Prasad to resign. “Personally, I think, Rajiv, you should consider resigning,” Chase said. The comments and suggestion for Prasad’s resignation come in the wake of a Franklin Reporter & Advocate report that showed Prasad worked to get supporters at the Aug. 14 council meeting to speak in favor of the proposed monument park, which would feature bronze statues of Mahatma Gandhi, Martin Luther King, Jr. and bronze busts of Nelson Mandela and Saint Teresa of Calcutta – even though the matter was never put on the meeting’s agenda, and manipulated the presentation of the issue by having it come up after public comment during that meeting, effectively cutting off any dissent. While stopping short of calling for Prasad’s resignation – Kramer said that what Prasad does is “in his hands” – Kramer said he had one thing to ask of the councilman. Prasad was visibly angered by the calls for him to resign and defended his actions. He read from a 2007 Township Council resolution supporting the placement of a “Peace and Non-violence” monument park – albeit with only statues of King and Gandhi – at the intersection of Foxwood Drive and Easton Avenue. Easton Avenue is a county road, so the request went to the Somerset County Board of Chosen Freeholders, where it was denied. That’s not true, as township attorney Lou Rainone pointed out. Resolutions passed by a governing body express the intent of that particular body, and expire at the end of the year in which they were passed, so no formal rescission is necessary. Prasad also argued that the money was raised for the monument park’s construction in 2009, and that donors are asking him where the park is. “The process was followed,” Prasad said. Sept. 13 Township Council meeting, during which residents eviscerated the council in general, and Councilman Prasad in particular, over the “Peace and Nonviolence” monument park controversy.